View More In Cinnamon - Page 4. 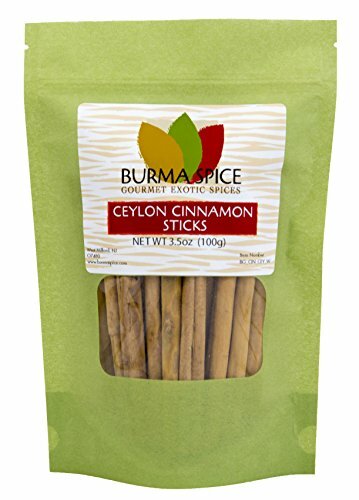 We've found the most flavorful, exotic Ceylon Cinnamon for you. Also known as "true cinnamon" has a distinctive flavor with hints of clove. Ceylon Cinnamon is made of thin fragile layers rolled like a cigar. These sticks are really easy to break into pieces and light brown in color. It is the sweetest and least spicy of all the cinnamons. Ceylon Cinnamon smells mild to some; if that is the case, Saigon Cinnamon is the one for you. Most well established recipes that call for Cinnamon came from Europe or the middle east and should use Ceylon Cinnamon. The same applies to any Mexican recipes that calls for Cinnamon. This is because the taste profile of these desserts were designed with Ceylon Cinnamon. 100% SATISFACTION - All Burma Spice products come with a 100% money back guarantee. Give us a try. You'll love the flavor of our 100% pure spice. 100% PURE - We never add preservatives or fillers to our spices. If you have any questions about this product by Burma Spice, contact us by completing and submitting the form below. If you are looking for a specif part number, please include it with your message.